Review by AllTheBestFights.com: 2018-09-15, pretty good fight between Jaime Munguia and Brandon Cook: it gets three stars. The undefeated current Wbo light-Mw champion Jaime Munguia entered this fight with a perfect boxing record of 30-0-0 (25 KOs=83%) and he is ranked as the No.4 super welterweight in the world (currently the #1 in this division is Jarrett Hurd). 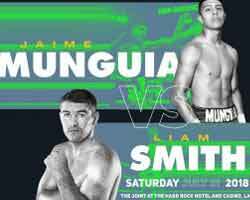 He has already fought four times in 2018 winning over Jose Carlos Paz (Jaime Munguia vs Jose Carlos Paz), Johnny Navarrete, Sadam Ali (Sadam Ali vs Jaime Munguia) and Liam Smith (Jaime Munguia vs Liam Smith). His opponent, Brandon Cook, has an official record of 20-1-0 (13 knockouts) and he entered as the No.40 in the same weight class. He suffered his only loss when he faced Kanat Islam last year (Kanat Islam vs Brandon Cook); after this bout he has won over Hector Carlos Santana and Miguel Angel Suarez. 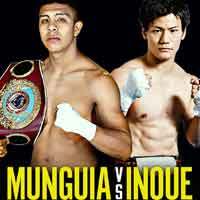 Munguia vs Cook is valid for the WBO World super welterweight title (Munguia’s second defense); undercard of Gennady Golovkin vs Saul Canelo Alvarez 2. Watch the video and rate this fight! Review by AllTheBestFights.com: 2018-02-10, tough exchanges with a good finish: Jaime Munguia vs Jose Paz gets three stars. The undefeated Jaime Munguia entered this fight with a perfect boxing record of 26-0-0 (22 KOs=85%) and he is ranked as the No.34 super welterweight in the world. He fought seven times last year winning over Miguel Angel Lopez, Uriel Gonzalez and Paul Valenzuela Jr in his last three. His opponent, Jose Carlos Paz, has an official record of 21-6-1 (12 knockouts) and he entered as the No.49 in the same weight class. 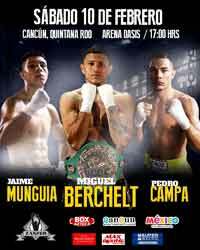 He suffered two consecutive defeats in 2016, against Hector David Saldivia and Guido Nicolas Pitto, but then he has beat Gumersindo Lucas Carrasco and Jorge Paez Jr. Munguia vs Paz is on the undercard of Miguel Berchelt vs Maxwell Awuku. Watch the video and rate this fight!